Buy this print in our store! Character. Like honor, it’s a word we take for granted and probably have an affinity for, but likely have never really had to define and may struggle to do so when pressed. It’s a word most men desire to have ascribed to them, and yet the standards of its attainment remain rather vague in our modern age. It’s certainly not a word that’s used as much as it once was. Cultural historian Warren Susman researched the rise and fall of the concept of character, tracing its prevalence in literature and the self-improvement manuals and guides popular in different eras. What he found is that the use of the term “character” began in the 17th century and peaked in the 19th – a century, Susman, writes, that embodied “a culture of character.” During the 1800s, “character was a key word in the vocabulary of Englishmen and Americans,” and men were spoken of as having strong or weak character, good or bad character, a great deal of character or no character at all. Young people were admonished to cultivate real character, high character, and noble character and told that character was the most priceless thing they could ever attain. Starting at the beginning of the 20th century, however, Susman found that the ideal of character began to be replaced by that of personality. But character and personality are two very different things. As society shifted from producing to consuming, ideas of what constituted the self began to transform. The rise of psychology, the introduction of mass-produced consumer goods, and the expansion of leisure time offered people new ways of forming their identity and presenting it to the world. In place of defining themselves through the cultivation of virtue, people’s hobbies, dress, and material possessions became the new means of defining and expressing the self. Susman observed this shift through the changing content of self-improvement manuals, which went from emphasizing moral imperatives and work to personal fulfillment and self-actualization. “The vision of self-sacrifice began to yield to that of self-realization,” he writes. “There was a fascination with the peculiarities of the self.” While advice manuals of the 19th century (and some of the early 20th as well), emphasized what a man really was and did, the new advice manuals concentrated on what others thought he was and did. In a culture of character, good conduct was thought to spring from a noble heart and mind; with this shift, perception trumped inner intent. Readers were taught how to be charming, control their voice, and make a good impression. A great example of this is Dale Carnegie’s How to Win Friends and Influence People from 1936. It focused on how to get people to like you and how to get others to perceive you well versus trying to improve your actual inner moral compass. There’s nothing wrong with the cultivation of personality, and we’ve offered plenty of advice on it here on the site. It can help you navigate the world, form relationships, and become successful. But personality is absolutely no substitute for character, which should be the foundation of every man’s life. Thus today we will be exploring the true nature of this largely forgotten ideal. We’ll be doing so by tapping into the writings of the late nineteenth and early twentieth centuries, when character was still king. The balance of these components within the soul of each man, and the way one or another predominates over others, is what makes a character unique and sets apart one individual from another. 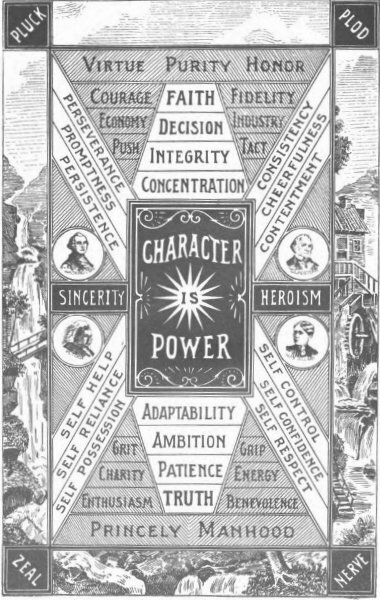 The one quality most associated with character in the nineteenth century was self-mastery – the dominion of an individual over his impulses and desires, so that he was in control of them, and not the other way around. A man of self-mastery embodies the kingship of self-control and can direct his will and make his own choices, rather than being a slave to his base impulses. Moral discipline is also a quality that not only allows a man to bear hardship stoically, but even to actively seek out a rougher, more austere life, one that eschews the kind of indulgence that deprives character of needed training and leads to softness. Character cannot develop in an environment in which ethical decisions are forced upon the individual. Character is a product of judgment, discretion, and choice – born from a man’s free agency. A decision that is coerced cannot be a moral decision, and thus cannot be a decision of character. “Character gains through its expression, and loses through its repression. Love grows through its expression. Sympathy grows through its expression. Knowledge grows through its expression. The artistic sense grows through its expression. The religious sentiment grows through its expression. The capacity for instruction, for administration, for command, grows through its expression. The more a man does in any line of wise endeavor, the more he can do in that line, and the more of a man he is in that line. And the refraining from the free expression of love, or of sympathy, or of knowledge, or of the artistic sense, or of the religious sentiment, or of the power of instruction, of administration, or of command, both limits and lessens that which is thus repressed. There are many things that engrave our character upon the clay of our lives, and shape our character for better and for worse into a unique set of scratches and grooves. Our character begins to be shaped from the very time we are born and is influenced by where we grow up, how we are raised, the examples our parents provide, religious and academic education, and so on. Our character can be dramatically altered by a life-changing tragedy – the contraction of a disease, a severe accident, the death of a parent, child, or spouse. Such events may turn a man bitter or cynical, or may cause him to discover energies of soul and feelings of hope and compassion hitherto unimagined. A man’s character can also be greatly formed by a call to take upon himself a mantle of leadership during a crisis or emergency – an event that tests and exercises his physical and mental abilities. “The important elements of character-making—or character-shaping—which we are most likely to overlook or undervalue are the exceptional impressions made upon us by casual acquaintances in our earlier life, and the quieter influences exerted over us by those with whom we are closely associated in after years—when our characters are commonly supposed to be fully and finally established. If we could trace back to their first exhibit some of the characteristics which now mark us most distinctively, we should perhaps find that we owe their development, not to the steady training in their direction received by us at home or in school, but to the sudden disclosure of their attractiveness in the life of some one whom we were with but for a brief season; or, again, we should see that the temptations which try us most severely, and the evil thoughts and imaginings which have given us greatest trouble in life, are the outgrowth of germs planted in our minds by persons of whom we have no distinct recollections apart from the harm they thus did us. Nor is it in childhood only that our characters are shaped and directed by our associates. The best characters are always open to improvement, and always in danger of deteriorating. Many a husband seems actually made over by his wife; and many a wife seems absolutely another person through her husband’s influence, after a few years of married life. It is perhaps a friend of our maturer years whose purity and nobleness, whose gentleness and grace, whose spirit of fairness and charity, or whose well-defined views on every point of ethics where he has a conviction, impress us with the correctness and beauty of his ideal, gradually influence us to his ways of thinking, and inspire us to strive toward his standards of judgment and feeling. Deciding to become a man of character means choosing to live a more disciplined and less selfish life. So why undertake such a hard path? The founders rightly saw that without a people of character there could be no trust and justice, and thus no true community or stability. No true pursuit of happiness. Is our character influencing others for good and helping them build their own power and strength? Are we doing our part to be a man of character and infuse our culture and nation with vitality? What grooves and lines are you engraving upon your character each and every day? Character is our legacy – what will yours be?